Timberdoodle Lodge is located four miles east of Highway US 41 approximately halfway between Escanaba and Marquette in Michigan’s Upper Peninsula, 16 miles north of Lake Michigan and 17 miles south of Lake Superior. This location places the lodge near the geometric center of the Upper Peninsula: North, South, East, West. The lodge was built in 2002 by the Anderson Family and has over 1000 acres of private property available to its guests. The west branch of the Whitefish River flows through a large portion of the property. Timberdoodle Lodge is open year round. Whether you enjoy campfires with S’mores or playing in the snow, Timberdoodle Lodge has something for you. Michigan Timberdoodle Lodge has accommodations for 1 to 50 people, for rent in Rapid River Michigan. Lodge is located in the central U. P. This Michigan vacation rental lodge sleeps from 1 to 50 people. Our lodging is famous for flyfishing (fly fishing) and fishing the White Fish River for salmon, steelhead and trout fishing. 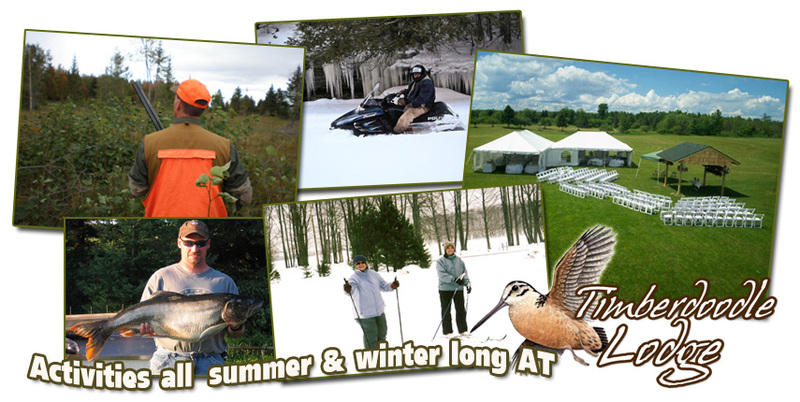 It’s perfect for a fishing trip, hunting trip, winter sports, bird watching, canoe rental, cross country skiing, mountain biking, trail hiking, canoeing, boating, river rafting, downhill skiing, off-road biking, golf, MI snow mobiling on our Snowmobile Trail System. Hunting on our private hunting preserves. Winter sports such as cross country skiing, downhill skiing, snowmobiling, winter steelhead fishing. Bird watching, Mountain biking, trail hiking, river canoeing.